Caterpillar doesn’t make giant earthmoving machinery. Exxon Mobil doesn’t sell gas. Home Depot doesn’t provide lumber and lawn mowers. Rather, they build relationships with customers — and solve people’s problems. We correlated data on 90 billion installs and 4.5 billion ratings of more than 13,000 Fortune 1000 company apps to stock market valuations over time to learn how. In fact, mobile leaders in the F1000 grow market value 15% faster than mobile laggards, and are 1.9X more likely to be financially successful. Caterpillar has 355,000 mobile-app-using customers; Exxon Mobil, over 400,000. And Home Depot? A massive 17.7 million. These companies are financial winners, capturing outsized stock price growth. They connect with customers one-on-one at scale, giving them unmediated and instant communication channels: an unparalleled advantage over their competitors. Sure, Google, Facebook, and Amazon lead the pack. Google has over 73 billion mobile users in aggregate, and Facebook has just over 6 billion. Both grew fast in 2016: 18.5% and 35.4%, respectively. And Amazon, with more than 4X the number of mobile users than the entire rest of the retail industry, captured almost $102 billion more stock price growth than its competitors. But some “old school” retail and manufacturing companies are winning, too. Best Buy isn’t just bricks and mortar; the company has 50 million mobile users. Lowe’s has 6 million, and Costco is not far behind, as both companies transition existing customers to mobile. GM and Ford are not just competing to sell cars — they’re competing to connect to customers at scale, with almost 40 million mobile users between them. All of these companies understand one thing: Winning at mobile means winning. This is a 20,000-word blog post, essentially a full data-driven research report. Use this table of contents to get around quickly. No time to read now? Get this full report in PDF for free. What is a unicorn dinosaur? 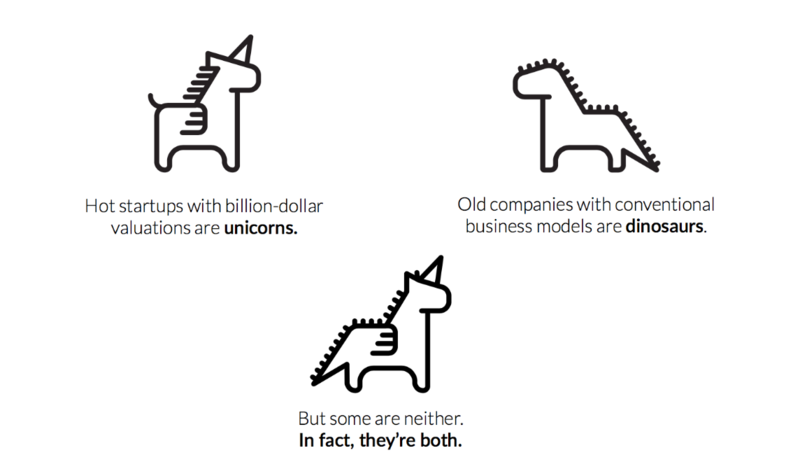 Hot startups with billion-dollar valuations are unicorns. Old companies with conventional business models are dinosaurs. But some are neither. Many Fortune 1000 companies have been around the block. They make actual, real, physical products. Their products are industrial, B2B, or resource-based. And yet, these companies have a modern mindset. They think deeply about technology. They build and deliver modern mobile apps. They ensure their websites work great on mobile devices. In short, they understand MobileBest, even though they are not mobile first. To probe the correlation between mobile success and financial success and find the Unicorn Dinosaurs, we gathered stock prices for Fortune 1000 firms in February, June, and October of 2016. We analyzed change from three to six-month performance, and we calculated each firm’s results over the mean. Finally, we sorted all Fortune 1000 companies into four categories based on relative financial performance. Next, we looked for all the apps for all Fortune 1000 companies, including 2,800 of their named subsidiaries. We found about 13,000 apps; then we determined the number of their users via the download bracket that Google Play publicizes, adding a representative additional number for iOS. 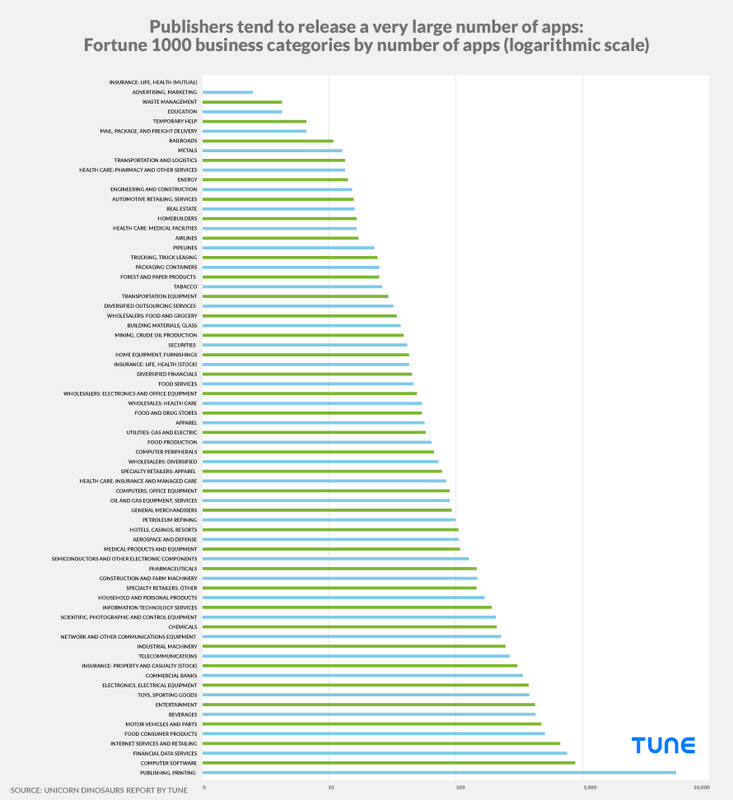 In addition, we used TUNE’s App Store Analytics data to find the number of reviews for each of those apps in order to judge engagement levels. Then we compared the categories. From our research, it’s clear that MobileBest companies are financially successful. In fact, Fortune 1000 companies that are top 10 in their business category in number of mobile customers significantly outperformed the market. But companies that outperformed competitors at mobile customer acquisition fared considerably better. For example, Fortune 1000 firms that led in mobile customers (with a minimum floor of 5,000) beat competitors by 15.1% in terms of stock market value. Brands with at least 50 ratings per app — not a huge task, one would think — beat brands who didn’t engage well with customers on mobile by 14.1%. And companies that simply had more than five apps outperformed others by 8.5%. There are some industries, such as retail, internet services, news, and other consumer-oriented categories where this aligns easily with common sense. The smartphone is our collective gateway to global culture, information, services, and supplies, and winning on this platform should have a strong impact on winning with customers. However, there is no compelling reason to suppose that consumer mobile penetration should be aligned with business success in many other Fortune 1000 business categories. For example, being MobileBest is not obviously an important priority for companies in chemical, energy, engineering/construction, metals, and mining businesses. And yet, likely because investing in new technology is a reasonable proxy for businesses that are successful, we still see alignment. If a company is succeeding in mobile, it’s not a guarantee of financial success. However, the firm is almost 2X more likely to be a financial bull or leader, compared to mobile bears. In fact, 65.4% of companies that demonstrate financial success are also leading their business category in mobile customers. Examples include 3M, Amazon, AT&T, and Best Buy. 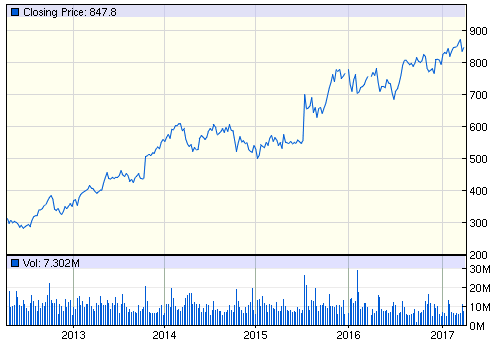 Joining Best Buy in the retail space is CDW, and there are resource companies such as Exxon Mobil here as well. Interestingly, Exxon Mobil has over 400,000 mobile customers. Along with Exxon Mobil, perhaps one of the more unlikely examples is Caterpillar, which combines serious heavy-duty engineering with mobile apps for service, sales, and support. About 355,000 people are using Caterpillar apps on their phones, which they use not only to order parts, but also to inspect machinery for defects and servicing requirements. Another example that breaks the typical mold of mobile-first companies like Uber or Facebook is DTE Energy, a Detroit-based power company. 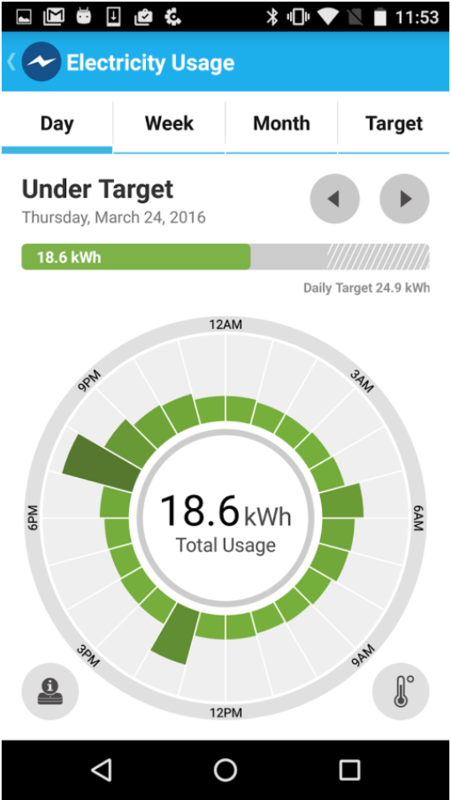 This utility’s app, called DTE Inspect, allows customers to see their power consumption in real time, set and track monthly electricity usage goals, and test ways to reduce power consumption. Successfully reaching customers on mobile doesn’t guarantee success, but it certainly improves a company’s odds. The opposite does happen, but about half as often. Only 34.6% of companies combine mobile failure and financial success, indicating that mobile success and financial success relative to your competition tend to go hand in hand. 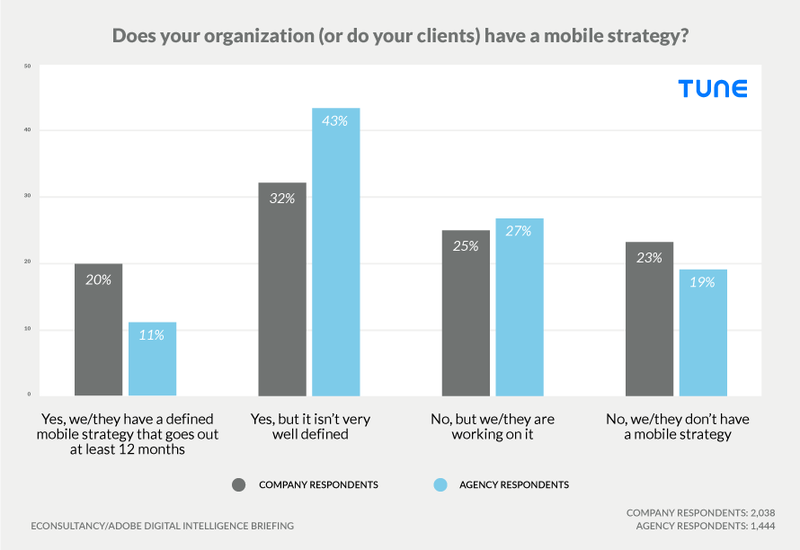 Interestingly, a company does not have to be a complete category dominator in mobile to see strong financial benefits. Our classification into Bulls, Leaders, Laggards, and Bears shows that even leaders in their categories get almost the same degree of benefit. In fact, 65.1% of companies that fell into the financial leadership category also place in the top and second ranks of mobile success. Companies that are bears in mobile, ranking near the bottom of their categories, have a 19.7% chance of still succeeding at growing shareholder value. That compares unfavorably to mobile bulls, who have a 37.9% chance. So it makes sense that even mobile bears still have about a one in five shot of significantly growing shareholder value as a financial bull. Each business has a 1 in 4 chance of being in any individual category financially, and the same probability for being in any given category for mobile success. That means there’s a 1 in 16 chance, or 6% probability, that a company would land in the same category for both measures … if everything was left up to chance. However, many companies did land in the exact same category for both measures, meaning that there is some degree of correlation between their mobile efforts and their financial results. Life insurance companies, for instance, have a mobile multiplier of 10, meaning that 60% of companies in the sector exactly match financial to mobile category. Outsourcing services have a 7.14 multiplier, with about a 43% matching rate. 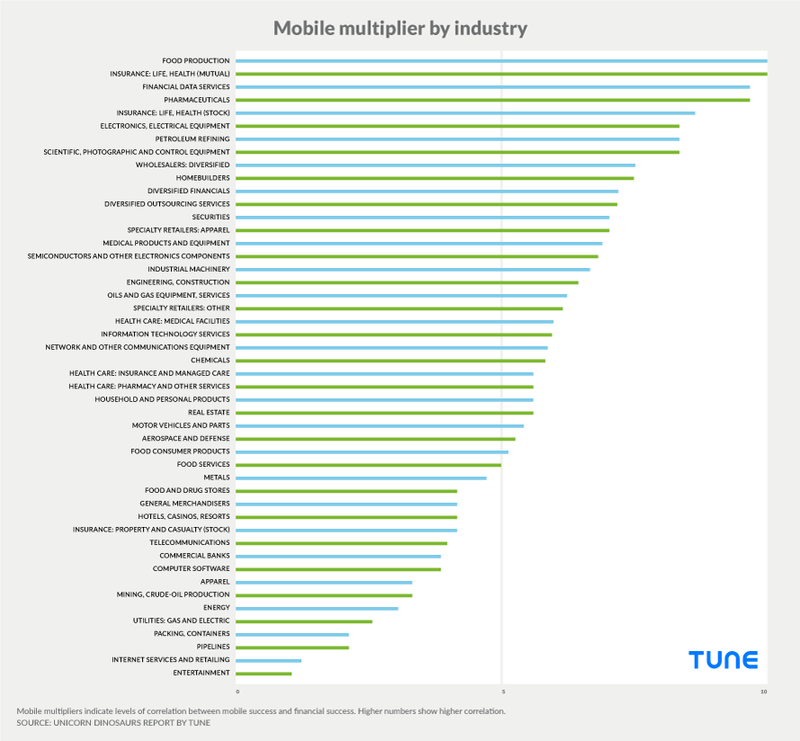 And telecoms have a 3.92 mobile multiplier, with a 24% match rate. The higher the mobile multiplier, the stronger the correlation between mobile success (or failure) and financial success (or failure). This is a very tough standard to meet, because a mobile bull could be a financial leader, which is close to a financial bull, or a mobile laggard could be a financial bear, and still not match. In fact, only 37% of companies match categories exactly. If we allow fuzzy matches, in which a category “matches” any other category one place away, the match rate increases to a staggering 83%. But that is a lower standard. In general, mobile leaders see outsized valuation growth. More apps, with more users, and particularly more engagement, ultimately results in a better opportunity to connect to customers, distribute digital product, promote real-world goods, understand product-market fit, and promote brand. The biggest indicator right now is simply: Does a company invest in mobile? Companies that do realize 8-15% higher stock market returns than companies that do not. Ultimately, that’s not surprising: Investing in technology and investing in customers is generally a smart path to growth. Clearly, this is correlation, not causation. Taking this relationship too far would be dangerous: companies cannot fix bad product, bad marketing, and bad customer service just by releasing 20 new apps. But just as clearly, close connections to customers are good for business. Mobile is the “three-foot device,” the most personal computer that never leaves our sides, even at night. Touching prospects and customers where they are, in the moments that matter, makes good business sense for everyone. Perhaps not surprisingly, publishers and printers release a very large number of apps, almost an order of magnitude more than the closest following industries: Computer Software, Financial Data Services, and Internet Services and Retailing. This is almost entirely due to Gannett, the largest newspaper publishing company in the U.S., which has published no fewer than 5,729 apps — mostly on Android — for each of its publications, plus apps for myriad niche interests for each of those publications. Publishing apps, however, is not the same thing as getting users. For all its efforts, Gannet has amassed an audience of only about 10,000 users per app, totaling just over 60 million. Active engaged audience size is, of course, the key, and that’s what matters most. 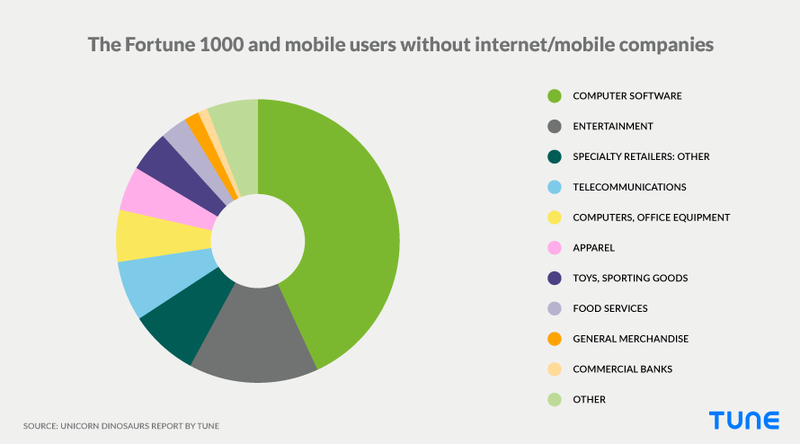 The industry that by far owns mobile users is Internet Services and Retailing. This category contains the behemoths of the mobile ecosystem, Google and Facebook. LinkedIn is here too, as is IAC (InterActiveCorp), Yahoo, eBay, Amazon, and Groupon. Altogether, this business category has 83 billion aggregated users — 91% of all mobile users for all Fortune 1000 companies. Given what we’ve already seen, it won’t shock you that Google is tops, with 88% of all the mobile users in Internet Services and Retailing, and 81% of all Fortune 1000 mobile app users. Note that in this chart, Entertainment, Computer Software, and Internet Services and Retailing are displayed in exponential notation. If they were not, these bars would extend far off the chart. Google, or Alphabet as the company is now known, is the world’s second most valuable company. Depending on Apple’s yet-to-be-released plans in the areas of artificial intelligence, mixed reality, and smarthome/IoT, Google is potentially on track to displace Apple. There’s a reason for that trajectory. 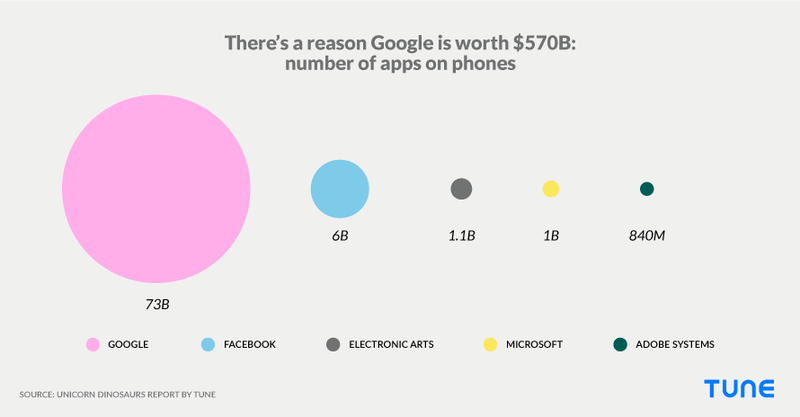 Google has 12X more apps on phones than its closest rival, Facebook. In fact, if you add up all the apps it has on all phones globally, Google has an aggregated total of 74 billion users before de-duplication. 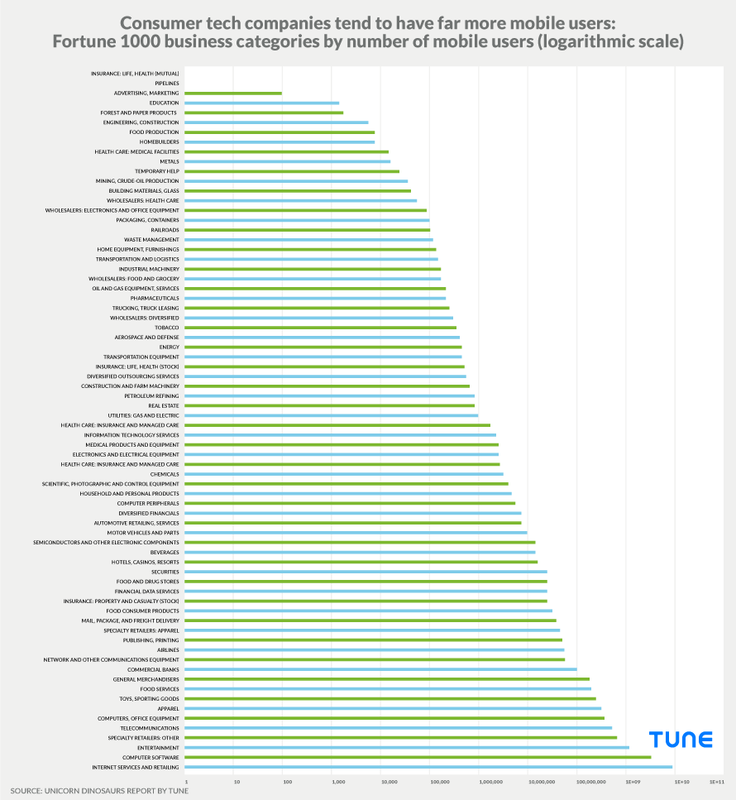 That’s 80.35% of all mobile users for all Fortune 1000 companies. And that’s one app for every single person on the planet, 10 times over. How does Google achieve this massive number? Simple. The company has at least 334 mobile apps, several of which have more than a billion users each. Average them out, and the typical Google app has 220 million users. This is unprecedented scale and penetration. It’s good to be king, and it’s good to own the world’s biggest mobile platform. In the period we studied the market, Google grew in valuation by a very healthy 18.47%. That’s significant for any company, but it’s especially significant for Google. The company’s market capitalization is currently $578 billion. Serious double-digit growth on market caps in the hundred billion dollar and up range is not normal. Facebook doesn’t have anywhere near the number of mobile users, counted per app install, that Google has. Owning the world’s dominant mobile ecosystem has its advantages. 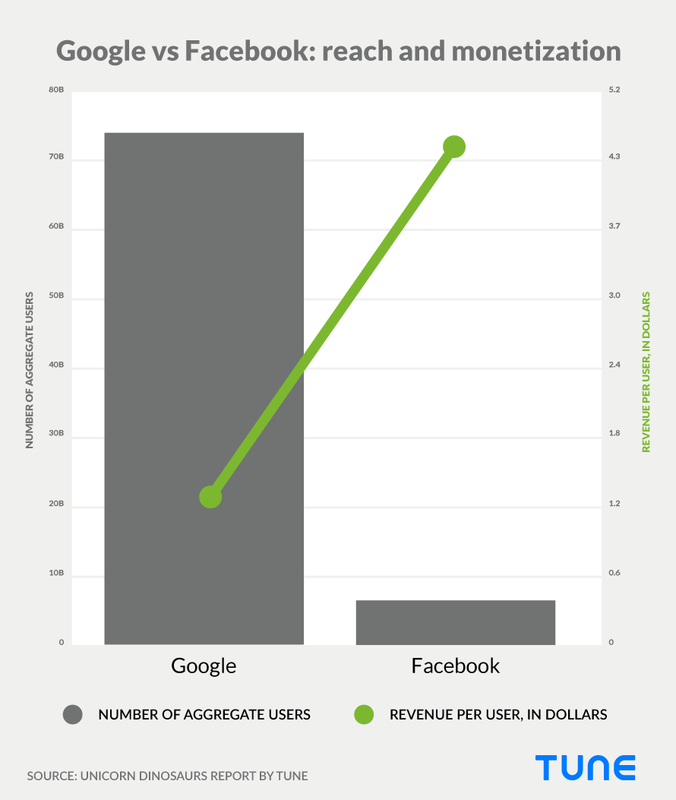 But Facebook currently monetizes much better than Google on its smaller base. Facebook currently has about 6.1 billion users for its various apps, primarily Facebook, Messenger, Instagram, and WhatsApp. Google easily has 12X more users, bringing in $90 billion in annual revenue from them. But Facebook monetizes each user almost 4X better. With its $27.6 billion in revenue, Facebook is making $4.51 in annual revenue per user versus Google’s $1.22. That’s amazing effectiveness via greater efficiency on a smaller base, since Facebook does it with essentially four apps. Another way of looking at it is that Facebook has developed the ability to connect advertisers and consumers at scale with a level of intimacy that surpasses Google, and Google has to make up the deep engagement factor in Facebook’s few apps by spreading engagement thinner on a wider layer of apps. The future winner between Google and Facebook — if indeed it’s a battle — will be decided by Google’s ability to monetize each user better in the thin layers, perhaps by going deeper in some select number of them, and Facebook’s ability to continue to scale its services while not overloading its apps’ ad-serving carrying capacity. And, of course, by growing its aggregate number of users. As it is, Facebook grew its market value 35.4% during this study — almost double Google’s rate. Again, the number is significant, but even more significant is that Facebook is not some tiny startup where any growth sends the dial shooting up. 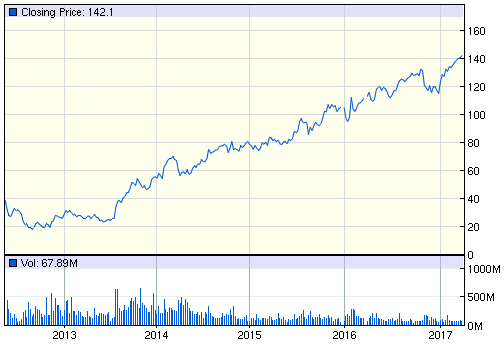 Facebook currently has a market capitalization of $408.3 billion. This is no longer a small company. 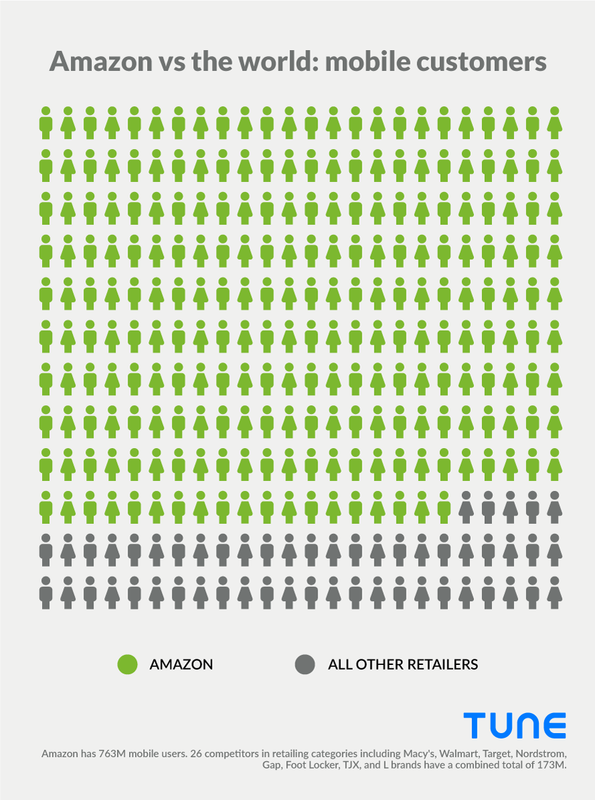 Amazon is a force of nature in commerce. It is eating almost all the growth in retail in multiple categories, and there’s an obvious reason why: more than 700 million mobile users across its entire mobile ecosystem. That’s 4.4X all of its competitors in the General Merchandising category and the Specialty Retailers: Apparel category. The result has been that Amazon’s stock has appreciated much more than all of its retail competitors. In fact, in the 12 months of data we gathered for this report, Amazon stock increased in value $102 billion more than all of its competitors and captured almost 6X more value growth. To compete, retail companies are going to have to work harder to reach their customers one-on-one via mobile and provide a better experience. 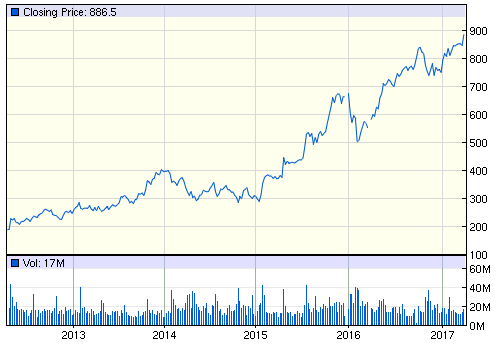 Amazon has always been a special company on the stock market. Founder Jeff Bezos has had an almost uncanny knack for reinvesting all (and sometimes more than all) of the company’s profits back into product development and market extension, rarely choosing to show the market a profit. In the past two years, however, the giant’s growth has been too significant to ignore, and investors have decided to reward the company with significant valuation increases. In the period of this study, Amazon stock jumped 43.5% … for a company with a current market cap of $429.8 billion. We see the investing-in-new-technology proxy in action in the Aerospace and Defense category. Here, there’s no particular reason why the top five companies in terms of mobile users should also be doing well in the stock market. Virtually no consumers, after all, need Boeing’s app on their phones (although maintenance and repair personnel might). And yet, there’s strong correlation between mobile investment and business success. A category where mobile success is more obviously connected to financial success is Car Sales and Service. Here, three of the top four companies in terms of mobile penetration are also winning in the stock market, while three of the bottom five are losing. Financial Data Services is a hybrid of both. Clearly, there are circumstances where personal financial tools on mobile devices can be game-changers. But just as clearly, sheer technological prowess is going to serve a modern financial services company well. Three of the top four financial services companies in mobile are also winning in stock price growth. Only two of the bottom nine in mobile are also winning financially. Entertainment is a fairly good example of MobileBest in action. Five of the top seven MobileBest companies — including Walt Disney and Time Warner — are also financially successful, in terms of stock market valuation growth. Four of the bottom five, including AMC and 21st Century Fox, are challenged. Clearly, however, there’s also a solid middle suite of companies, like Regal, Scripps, and Cinemark, that are not clear mobile winners … but are currently doing very well for their shareholders. They’d be well-advised to double down on mobile, however, because this is a category under siege from GAFA. Google, Apple, Facebook, and Amazon (GAFA), all of which are extreme examples of MobileBest, are deeply invading traditional entertainment companies’ space (i.e. music and movies). Relatively recent and small new media competitors like Netflix, Spotify, and Pandora are right on their heels. What’s significant about Netflix, Spotify, Pandora, and other similar startups? Mobile and connected device apps featuring strong one-to-one relationships with customers who, by using those apps, give these brands broad and deep understanding into their preferences and behavior. Which, of course, those companies invest right back into improving their services. Breaking that virtuous cycle is hard, and will only get harder over time. There are counter-examples as well. Or, at least, examples that are not entirely clear-cut. Hotels, Casinos, and Resorts is one such category. One the one hand, this industry is an obvious scenario where a one-to-one connection with customers on mobile should lead directly to financial success. Players in this space with significant mobile prowess should be able to understand customers better, meet their needs at a more personal level, and implement high-tech solutions, such as guest access to suites via apps on their phones. However, that’s not clearly happening here. While two of the top three by mobile users are financially successful and two of the bottom three are challenged, there’s clearly significant counter-trend examples. Starwood and Hilton experienced some headwinds in 2016 financially, in spite of being fairly high up on the list of mobile success stories. One positive for Starwood: Although the company was classified as losing in our early to mid-year financial analysis, the firm did manage to pull out an overall positive 2016 on the stock market. 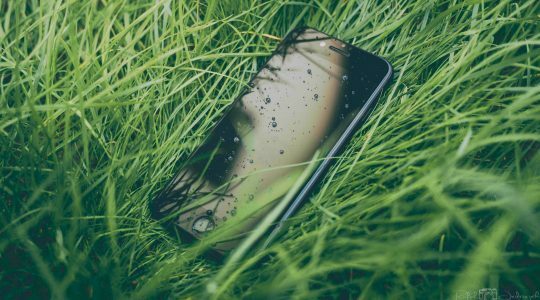 The lesson, however, is simple: Being mobile-savvy specifically and technologically savvy in general is good, but it’s not everything. Macro and micro business conditions matter. Specialty Retailers: Other is a 43-company category with players like Costco, Home Depot, Best Buy, GameStop, and Netflix. It is 91% aligned (financial success versus mobile leaders). Highlights include Netflix, with over 500 million mobile users and winning financial performance. Home Depot, with 17.7 million, is also doing extremely well, and GameStop has an extremely robust mobile strategy which has propelled that retailer to success. Here are the top 15 in the category. 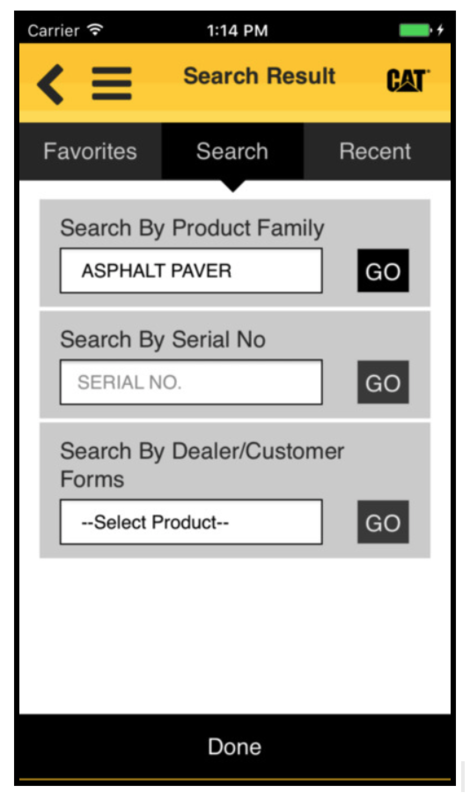 Motor Vehicles and Parts is a 25-company category with 88% alignment between mobile success and financial success. Players include the obvious, like General Motors, Ford, and Tesla, as well as Johnson Controls, WABCO Holdings, and American Axle & Manufacturing. GM is a highlight here, with an industry-leading 6.2 million mobile users and bullish financial performance. Despite its tiny size, Tesla has the third-most mobile users. Tesla is also an example of the limits of this kind of purely analytical analysis. The company is successful in mobile, but its stock valuation trends land it in the losing group. However, anyone familiar with the automotive industry is aware that Tesla is perhaps the most interesting medium to long-term play in the space. Specialty Retailers: Apparel is an example of what can happen to a category when a black swan event happens. The industry is tough enough already. Out of 19 companies, 10 lost significant amounts of stock market value over the 12 months of the study, and one was delisted. Two are not traded publicly, and one was acquired, so the available financial data on the majority of these companies is limited. Only three of the top six are winning mobile customers and outperforming their competition financially. But the mobile-win-equals-financial-win theory breaks down in Apparel with many of the companies. For instance, while Gap is doing well with mobile, as are American Eagle Outfitters and Caleres, they’re still losing financially. And bottom-feeders in the mobile world like Burlington, Ross, and TJX have no visible mobile apps and no measureable users, but are outperforming many of their competitors. For the same reason as the General Retail category: Amazon. 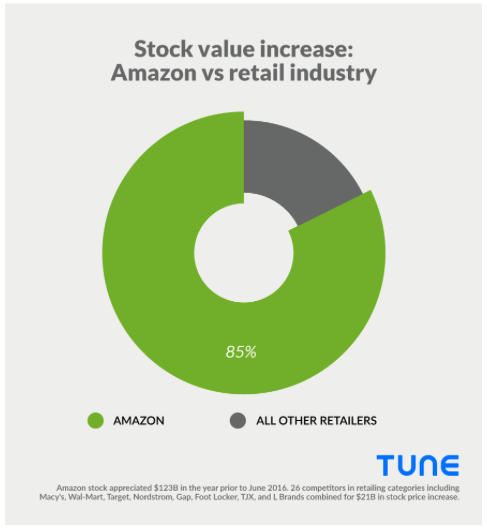 Amazon is eating retail. 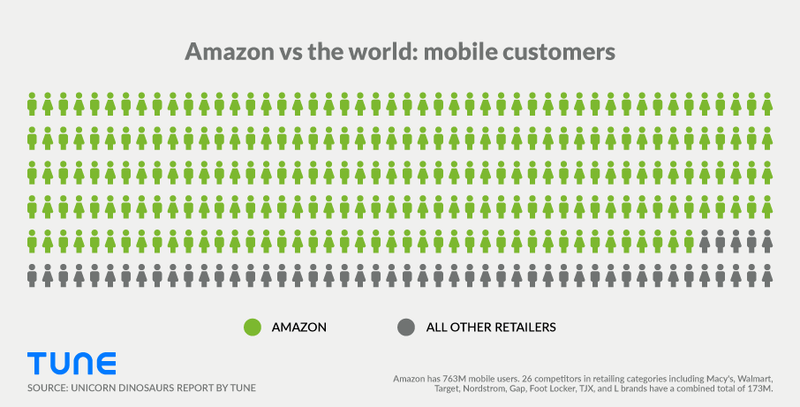 As visible in the chart, Amazon dwarfs all other specialty retailers in number of mobile users, and has also done extremely well in terms of financial performance. Bear in mind that while Ross and Burlington look close to Amazon’s performance in this chart, Amazon is close to a $300B company while Ross and Burlington have $22B and $6B market caps, respectively. In other words, they are barely even comparable. A $300B company with 43.5% stock price inflation over the course of a single year is nothing short of spectacular. Burlington, Ross, and TJX are outperforming their apparel retail sector competitors because they are tackling a specific piece of the market: low-end retail. This works well in big-box scenarios, and hits primarily a low-value market segment that isn’t necessarily focused on e-commerce or m-commerce. So these players, in other words, are avoiding the Amazon effect … for now. To win, not only does Amazon follow the maxim of “meet your customers where they are,” — which often means mobile — but the retail giant makes it seamless. In addition, Amazon adapts to changing market realities quickly, which some brands such as Aeropostale have failed to do consistently. Mobile enables not only an intimate, one-to-one brand-to-consumer relationship. It also creates the ability to change strategies more quickly due to more accessible first-party real-time data and analytics on what’s working and what is not working, what is hot and what is passé. Both are particularly important in the fast-paced world of retail. 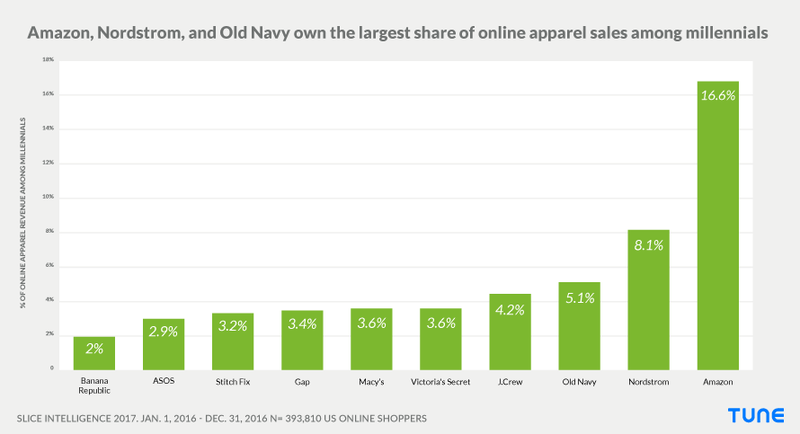 Millennials buy more clothes on Amazon than any other retailer; double what they buy at Nordstrom, and triple what they buy at Old Navy. General Merchandisers is a somewhat similar category with 12 competitors who are are even more directly affected by Amazon, since many of them sell packaged goods with little or no differentiation: Walmart, Target, Sears, Nordstrom, JCPenney, and so on. 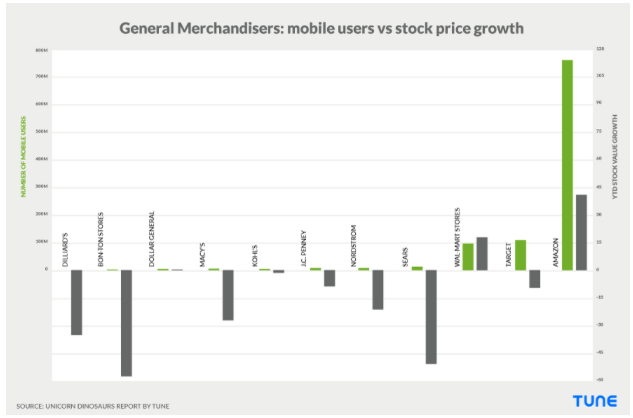 Almost the only retailers who saw significant stock price valuation growth in 2016 were those who have significant numbers of mobile users. Note, I’ve put Amazon into this category in spite of the fact that Fortune classifies the company as Internet Services and Retailing. While Target and Walmart are growing, Kohl’s, Sears, and Nordstrom are struggling. Macy’s has its own challenges, of course, but is still ranked above some of its competitors in financials. You can’t just buy success in mobile when it’s not core to your brand or your product. Apparel has had a tough 2016, with only four of 14 Fortune 1000 companies’ stock actually rising. 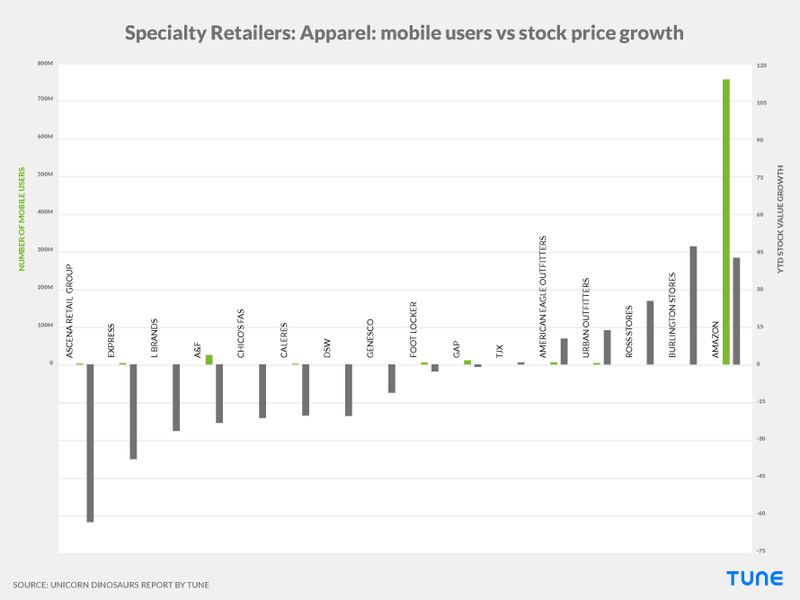 The losers include the two mobile giants of the apparel category, Nike and Under Armour, which are down 21% and 62% respectively, even though both companies appear — on the surface — to be successful on mobile. The problem is that mobile is not yet core to the value proposition that apparel companies offer to most of their customers. While Under Armour bought MyFitnessPal in 2015 for $475 million, and has 15 other apps with a total combined audience of well over 200 million users, and Nike has 18 apps with over 100 million users, they are mostly running and fitness apps. The companies’ core brand demographic may actually use them, but many who are in the market for shoes, apparel, and sports equipment do not. Mobile apps are not yet core to apparel brands’ customer experiences in the same way that Amazon’s mobile app is to its retail experience. Even app users who might be more likely to choose a Nike shoe because they’re using a Nike app, could easily be seduced into getting a Reebok. 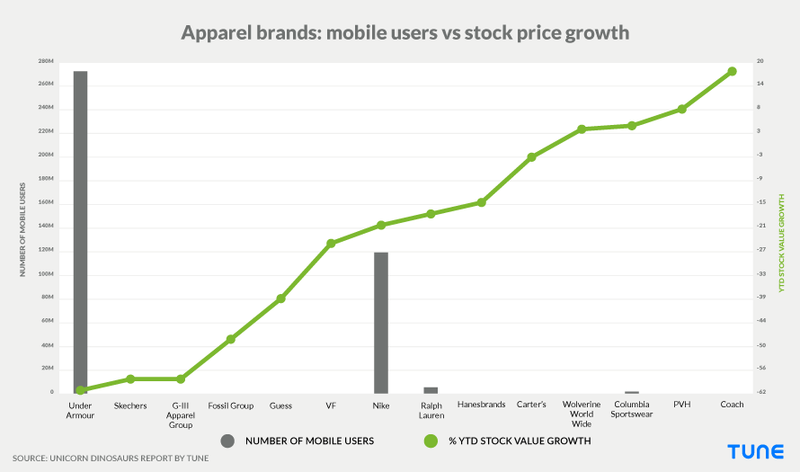 Nike and Under Armour, the only two apparel companies with significant numbers of mobile users, may actually have much better performance than appears in early 2016 comparative data alone. Each company has been on a tear over the past half decade, with Nike producing average annual shareholder returns of 25.5% from 2010 to 2014, and Under Armour producing even better at 58.4% for the same period. Nothing goes up forever, though; in the tough headwinds of early 2016, these two stocks were hammered. But it’s likely the fundamentals are still solid. It’s clear that MobileBest companies are financially successful. But we should explain what we mean by MobileBest and why it matters, beyond the financials. Very simply, it means what’s best for the customer is what’s best for the brand. 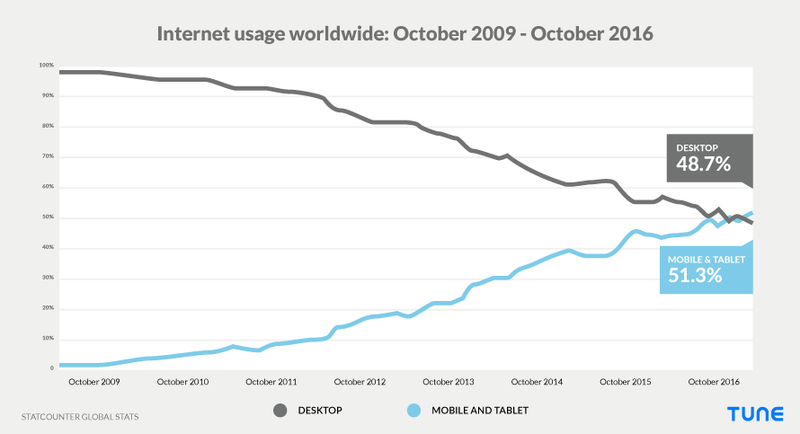 It’s not mobile first, necessarily, and it’s not mobile only. And it’s not just about apps, either. Rather, it’s an understanding that mobile is now the primary interface between people and the digital world … and the digital world is becoming a larger and larger portion of our existence, period. It’s a determination to meet customers where they are: to use apps where appropriate, mobile web where it makes sense, integrations into other mobile properties when opportunities present themselves, and desktop when the task demands. That deserves a little unpacking. Email is a channel. Social is a channel. Apps are a channel, as is web, whether mobile or desktop. Display advertising could be considered a channel, and search marketing another. Outdoor marketing, webinars, events, sales, trade shows — these could all be considered channels. Mobile, on the other hand, is not a channel. Mobile is where these channels live. Recent research from CITI indicates that 68% of our digital media time is spent on mobile. That means we’re using apps, sure, but it also means we’re watching video, messaging friends, reading and composing email, and surfing the web … on mobile. And that 68% will be 75% next year, 78% the year after, and so on as it grows. Mobile is the ecosystem. Channels live inside the mobile universe. Those billion-dollar brands include Facebook, Airbnb, Warby Parker, Zappos, PayPal, and Instagram. A quick look at Fortune’s Unicorn List shows similar names: Uber, Snapchat, Flipkart, Didi Kuaidi (China’s Uber), and Pinterest. How does a company have a one-to-one connection with their customers at scale? Via mobile: either in-app, or in authenticated, logged-in mobile web. The most personal computing device of all is the phone, and the phone is the device that’s never more than 3 feet from most people most of the time. The brands that walk alongside their customers and live in their customers’ purses know the most about their customers, have the deepest engagement with them, and the largest share of wallet. 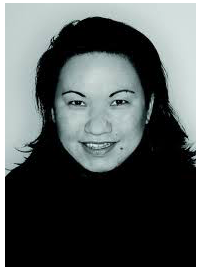 In short: they experience the greatest success, thanks to MobileBest. In spite of the massive opportunity mobile represents, many companies are not prepared, and not preparing fast enough. According to an Adobe study of 4,000 marketing pros, only 20% of companies currently have a mobile marketing strategy for the coming year. That’s in spite of the fact that 63% of companies in the Adobe study think the quality of customer experience on mobile is more critical than on desktop … and in spite of the fact that almost half of their digital traffic now comes from mobile. 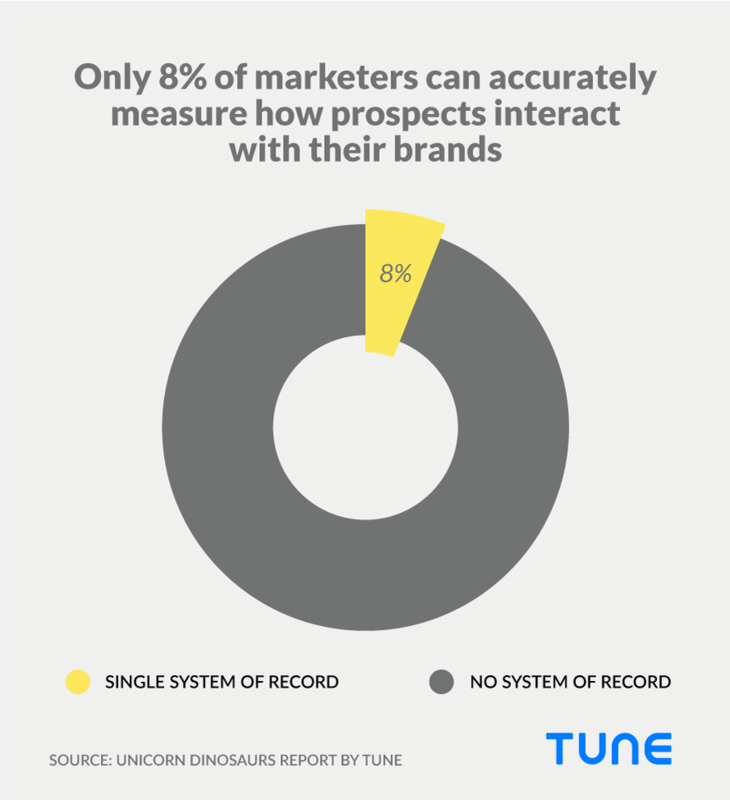 In addition, when TUNE asked a thousand marketers in March of 2017 if they were able to measure and manage all the data on how prospects and customers interact with their brand, only 8% said yes. Companies that want to win will need to address this, and quickly. There used to be technology companies and non-technology companies. Today, almost every company is a tech company, or it’s not in business for long. With the 6 billion global smartphones marker within sight, and the vast majority of human culture moving to digital storage and mobile-centric transmission, we are solidly in the data era. And that has implications. Reinvestment and change are the only options. Keeping the status quo is the most risky move you can make. Mobile success, like financial success, doesn’t happen by accident. MobileBest companies know what to do to make it more likely. Every brand needs a marketing system of record. Customers are spending almost three quarters of their digital media time on mobile. They’re time-shifting TV and watching Netflix. And they’re still using laptops during the day for work, or for more in-depth product research at home. Globally, the crossover happened late last year. And it hasn’t slowed down. Marketing executives need to understand the customer journey in a complex, mobile, multi-device, and multi-platform world. Customers may use your app, or they may visit your mobile-friendly website, or they may reach out via a messaging app. In fact, they’re likely to do all three. They expect you to know them, be responsive to them, and be able to serve them in a contextually rich way, however they choose to connect. Via a marketing system of record that measures and manages all the data associated with both prospect and customer connections to your brand. “We need that open-stack umbrella that will bring all these points into convergence … this is the biggest thing in the next 12 months. It’s a new category of stack, customer technology, the revtech stack. 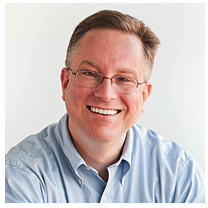 I have my marketing operations, I have my advertising, now I have to look at revenue … . Mobile time and activity is only increasing. Platform, media, and messaging channel complexity is following. 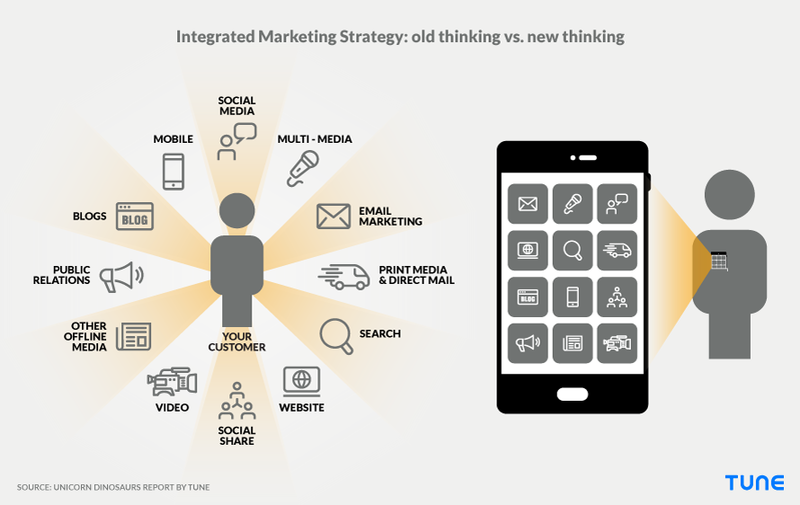 Smart CMOs will get ahead of the change by implementing their own marketing system of record. Know when to use apps. Know when to use web. Understanding the customer journey is step one. Building for it is step two. In mature markets like Europe and the U.S., the app gold rush is over. In fact, it probably peaked in late 2014 — an Adobe report suggests that from 2015 on app install velocity has slowed 5% in Europe, and a staggering 38% in the U.S. 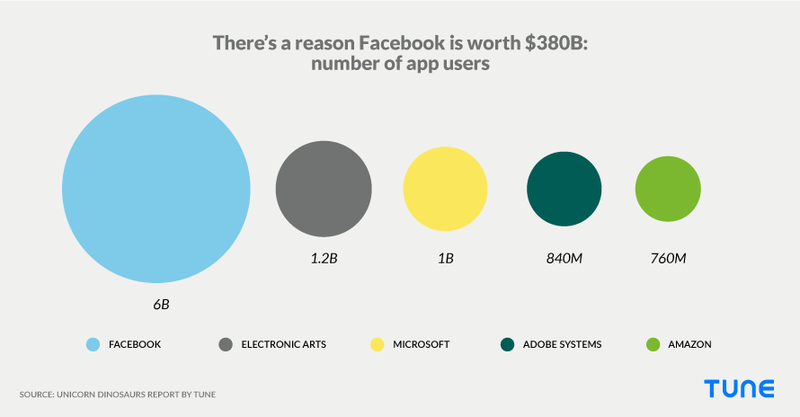 It is, of course, very important to contextualize that data: it’s from just 1,000 apps, and Adobe customers are likely to be enterprise companies or big brands. In other words, it’s not representative. At the same time, mobile web traffic to those big company websites has jumped considerably: 156% in Europe, and 69% in the U.S.
Apps are still desperately important because there is no other medium available that can deliver customer insights, customer engagement, and customer share-of-wallet the way apps can. There are also very few other ways to provide instant and real-time updates to your customers on a one-to-one basis. As the top mobile marketer at GameSpot told me, his mobile-app-using customers are more valuable than top level customers in the company’s loyalty program. But not everyone is going to install an app for every brand they do business with. In fact, very few will. So your mobile web experience needs to be top-notch. New technologies such as Google’s Android Instant Apps and Progressive Web Apps are increasingly good options, and Progressive Web Apps now allow for deep integration into Android, including the opportunity to deliver push notifications and to store some data locally for native-like speed and experience. 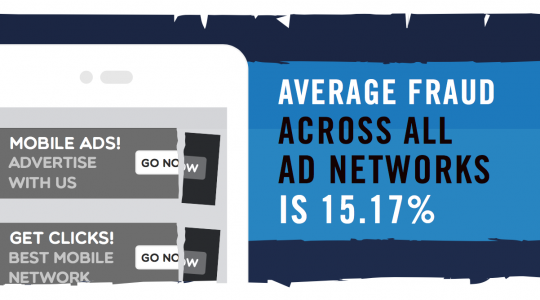 Mobile web is for prospects, casual customers … and some loyalists. Three years ago, mobile web was a poor third cousin twice removed of the mobile app: under-powered, unappealing, and neglected. Today it’s clear that web is top-of-funnel, where app is bottom-of-funnel. Web is discovery; app is loyalty. But the web is working its way up, and we’re seeing more customers who prefer to go web-exclusive. Apps? Yes. Mobile web? You bet. Experiment and do the best thing for your customers, regardless of the medium? Absolutely. “In aggregate it almost doesn’t matter. What touchpoints are going to be best in context of a specific company and its customers is the question. Be easier than the competition. Be more friendly. Beating the competition is the goal. Ultimately, everything you’ve done to build a unique brand plays to your advantage. Everything you’ve done to differentiate your product boosts your appeal. Brands can achieve all of these goals by meeting customers where they are: on mobile. That might mean an app, for your most dedicated customers. That might mean mobile web. It could be an Alexa Skill or a Google Action, excellent voice-first options for helping customers get information and manage services in their homes. It could be via a Siri integration, ensuring that customers can speak their requests to a friendly voice wherever they are. In the first part of this report, we saw how companies that are mobile leaders improve valuations by 8-15% more than mobile laggards. We also saw that companies that are the best of the best in mobile are almost twice as likely to be extremely successful financially as well, while the worst have only a 20% chance. There are many things a company needs to be to be successful. Today, mobile is clearly one of them. As part of the data gathering for this report, we also collected data on social following, using the two largest Western digital communities for that purpose: Facebook and Twitter. Partially to compare against mobile indicators, and partially just to see, we also checked average financial performance by social indicators. Interestingly, total social following is a much less reliable indicator of financial performance. Social media marketing is very widely utilized — many companies without a mobile app have tens of thousands of social followers — which may be part of the reason. Fortune 1000 companies that are in the top five in their industry for number of social followers saw an average gain of 2.86% in stock price over the course of the study. Companies that were sixth or lower returned 3.56%. Average Fortune 1000 return over the measured period was 3.3%. Also interesting: Twitter seems to be a better overall predictor of financial success than Facebook. Companies with more than 1 million likes on Facebook had stock returns of just 1.18%. Companies with fewer likes saw valuation increases of 3.88%. Meanwhile, those with more than 1 million Twitter followers rose 8.66%, and companies with fewer rose just 3.19%. As the numbers go higher, however, it becomes clear that a larger Facebook following is indeed indicative of a financially successful company. At 10 million Facebook fans, companies average almost 12% stock value inflation. At the same level on Twitter, however, companies average 14.45% increases. Fortune 1000 company data available from Fortune, with details on company size, industry, value, number of employees, and more. We then used this data to find 2,800 additional companies that are subsidiaries of Fortune 1000 companies, for a total of 3,814 named companies. We then searched through data from our App Store Analytics product on apps and mobile publishers for each of those named companies, and enriched our data with additional MightySignal data on number of reviews and ratings for apps. We then checked Google Finance 3- and 6-month trailing results, taken in February and June 2016, respectively, and checked 12-month stock value changes in October. We also gathered Yahoo Finance analyst buy/sell recommendations and CEO ratings at Owler. In addition, we searched Twitter and Facebook to find social followers for these companies and their subsidiaries. Using TUNE and MightySignal data, we found both the apps for all the companies and their number of users. We used the median of Google Play download guidance (if Google Play said an app had between 1 and 2 million users, we pinned the number at 1.5). We analyzed the relationship between number of Android downloads and number of reviews and ratings, and generalized that data to iOS to estimate the number of iOS installs. Then we estimated the degree of user engagement by comparing numbers of users and numbers of ratings and reviews. 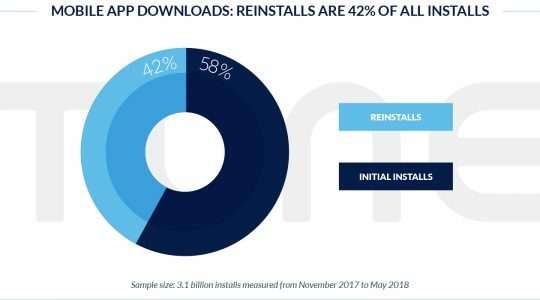 All told, we gathered data on over 90 billion installs of more than 13,000 apps, with more than 4.5 billion ratings of those apps. In addition, we collected data on companies’ social followers: more than 1.1 billion Facebook fans, and more than 150 million Twitter followers. The information contained in this report has been provided as an information service only. The accuracy or completeness of the information is only as reliable as the sources from which it was obtained. All statements and expressions are the sole opinion of the company and subject to change without notice. The company is not liable for any investment decisions by its readers or subscribers.